Colorado used to have giant redwood trees. We had a warmer climate, so we had many tropical insects also. That was about 34 million years ago. What a change from the Colorado we know and love today. 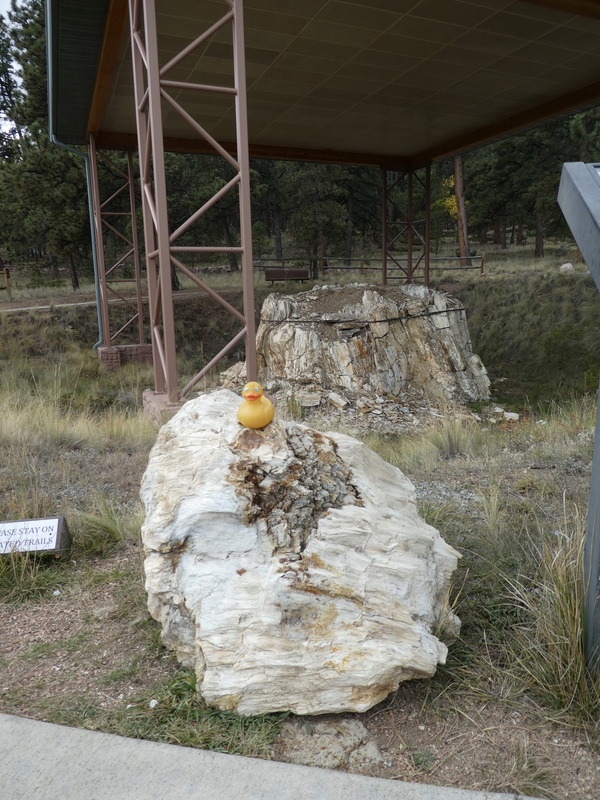 Today I, Zeb the Duck, took mom and a friend to Central Colorado, a little south and west of Colorado Springs, to Florissant Fossil Beds. 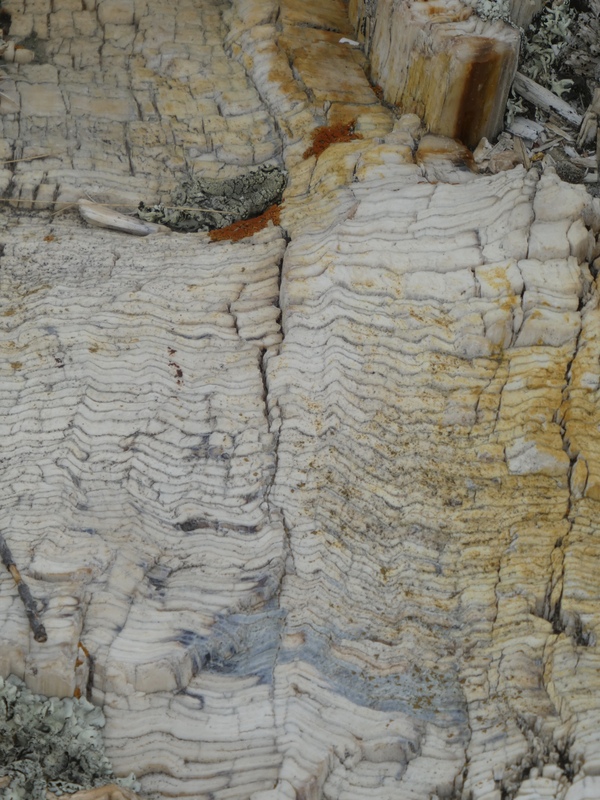 These fossil beds are now part of the U.S. National Park Service. It was a cloudy day, so we decided to see the outside things first, just in case we got some rain. About two miles from this sign, is the homestead of Adeline Hornbek. 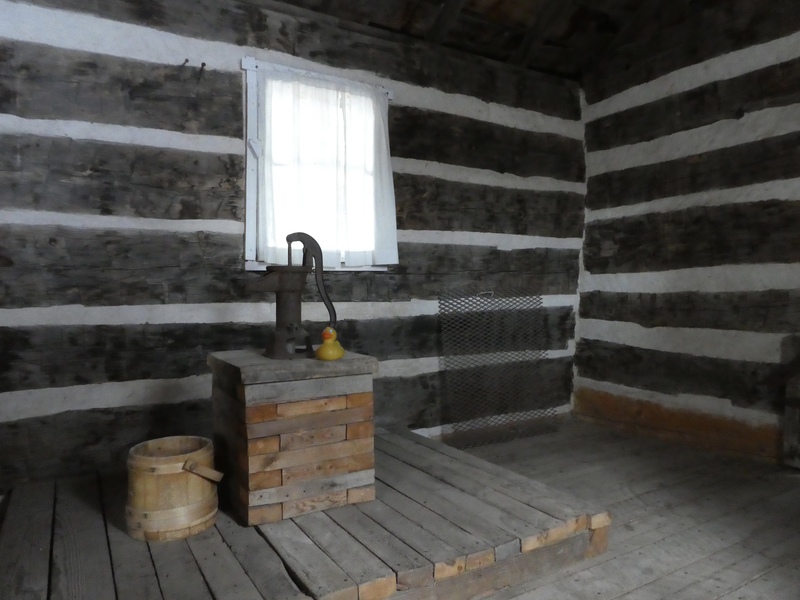 Back when women usually could not purchase land, Adeline acquired 160 acres to homestead. 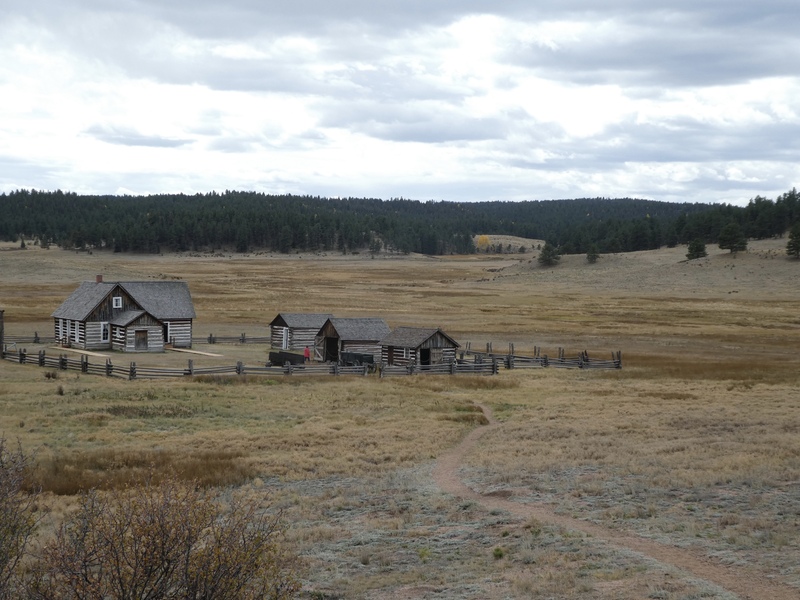 Her homestead is now protected by the National Park Service. In 1878, she had outlived two husbands and had four children to raise. She and her children farmed and ranched here. Today, her great great granddaughter, was in the house. 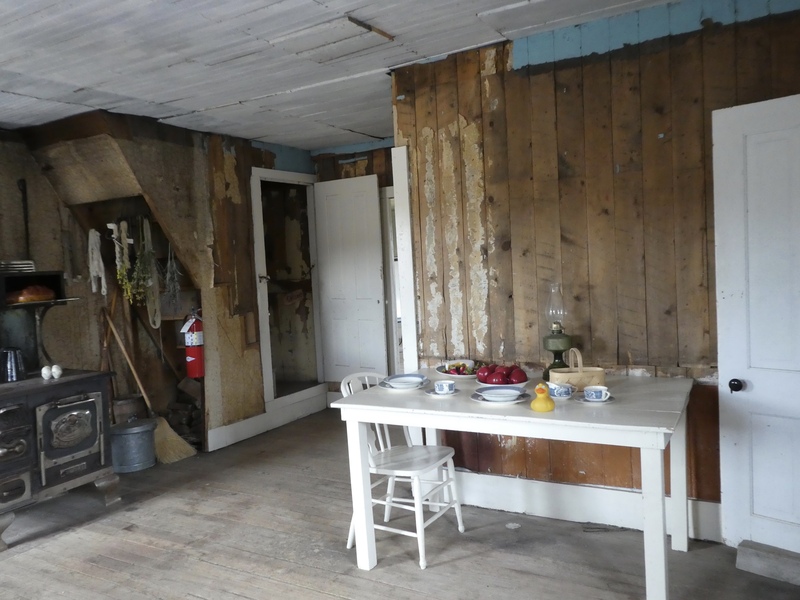 So tourists were allowed inside the home and outbuildings. Attached to the main house is the well house. An enclosed pump is less likely to freeze. The kitchen was large. On the right side is the door to the well house. To the left and to the front, is a door to the living room. The open door on the left leads upstairs where her sons slept. The rear door goes to another room, with a door to the outdoors. The living room is also rather large and has a wood stove for heat. 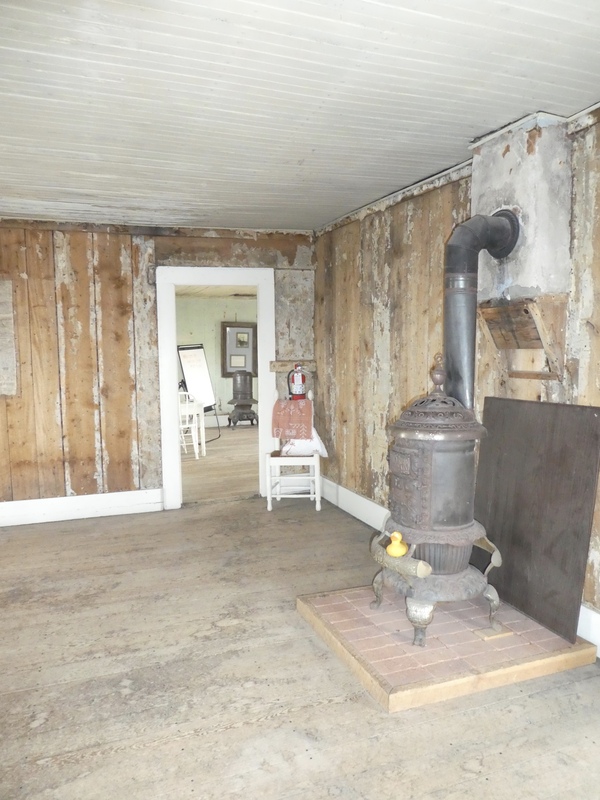 You can see the adjacent room behind also has a wood stove for heat. This is the pantry. With five people to feed, storage space was important. 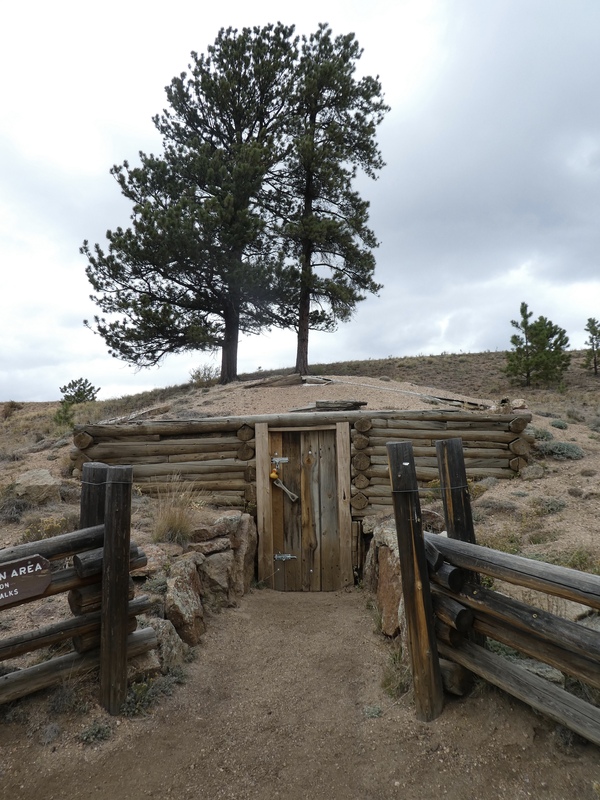 Outside, dug into a hill, is the root cellar. 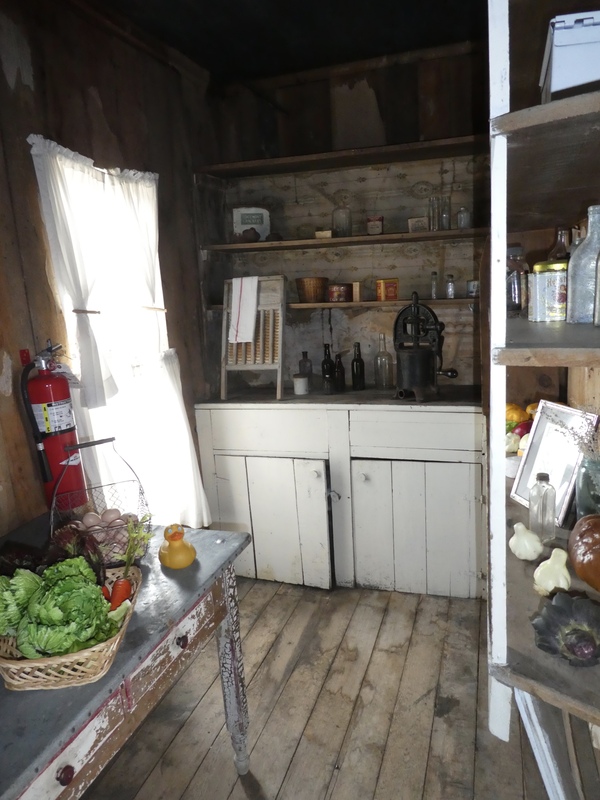 More food was preserved here for the long cold winter in the Colorado Mountains. 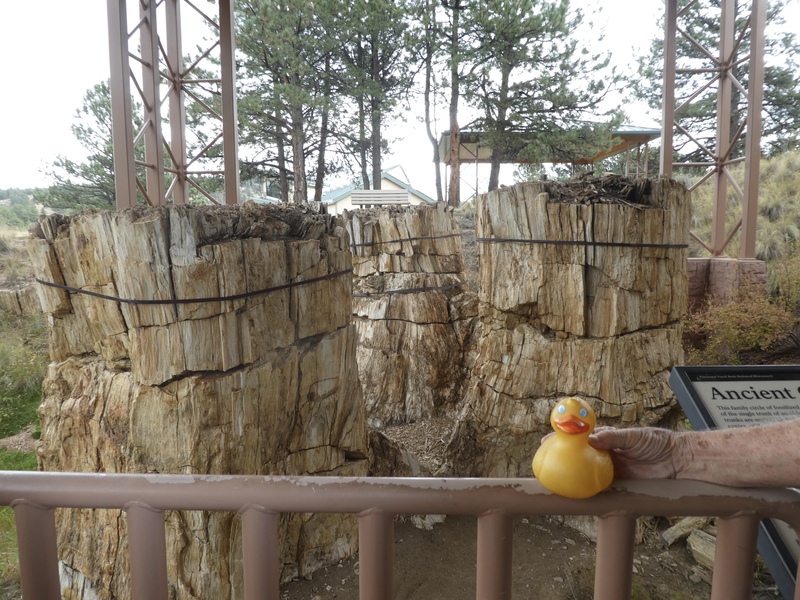 Going back to the Visitor’s Center, the fossil beds are outside, so we went there first. There are fossil exhibits inside also. 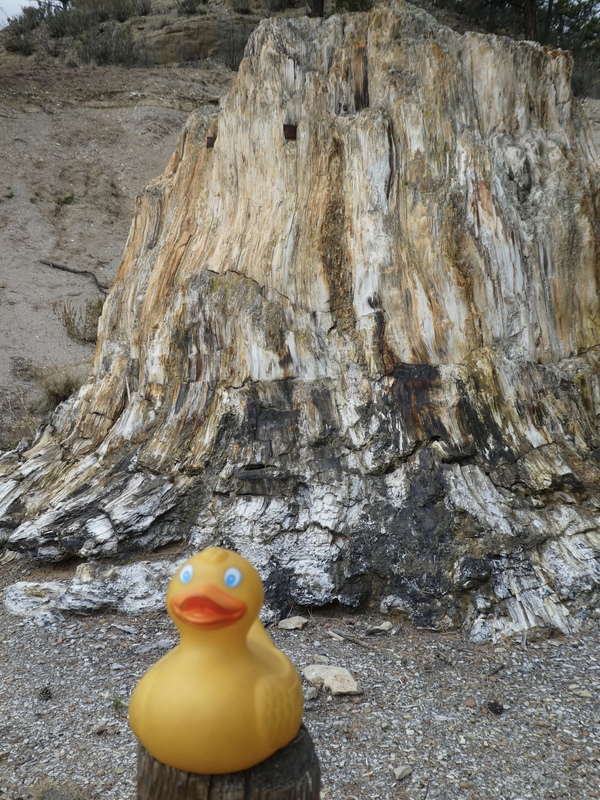 I, Zeb the Duck, am sitting on a large piece of petrified redwood tree. The huge petrified tree stump is under a manmade cover, to offer some protection for the fossil. Moisture in the stump, freezing and thawing, will damage the fossil. Humans are trying to slow the process. The sign says 34 million years ago the Rocky Mountains were warmer with wet summers and mild winters. This area was forested with towering redwoods, cedar, pines, mixed hardwoods and ferns. Now this is rare. A family circle of fossilized stumps grew out of the single trunk of an older parent tree. The 3 trunks are ancient clones, or genetically identical copies, of that parent tree. This is common now in California with coastal redwoods, but this trio of stone stumps is unique in the world’s fossil record. We hiked the one mile trail and arrived here, at the Big Stump. This massive petrified redwood stump is one of the largest fossils in the park. The tree was probably 230 feet tall and 750 years old when volcanic mud flow buried its base. In the 1800’s local residents excavated the stump and tried to cut it in smaller pieces. You can see 2 saw blades still in the stump toward the top, above my little duck head. The base is charred from volcanic mud and volcanic lahar. Further along, we see tree rings in the redwood fossil. These rings are still visible after 34 million years. 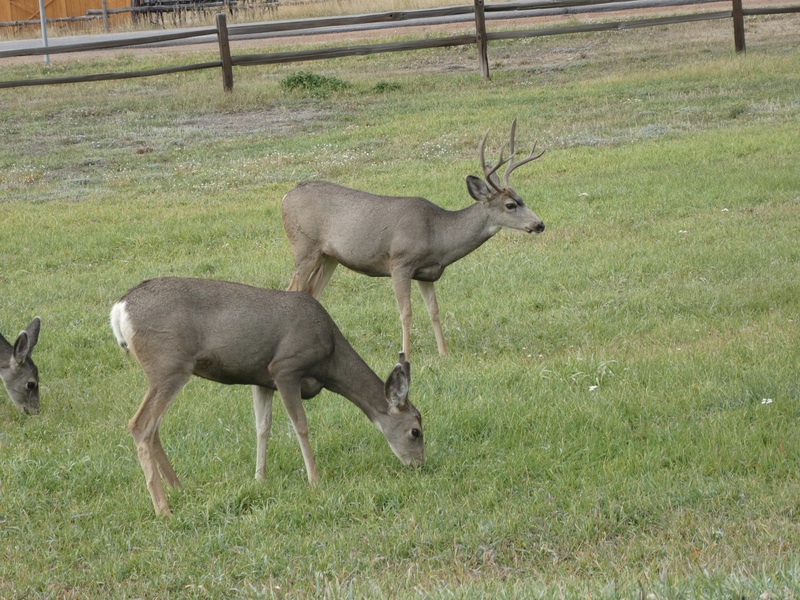 They provide information about environment and climate. The rings show more favorable growing conditions than coastal redwoods of California today. Tropical insects were also here. 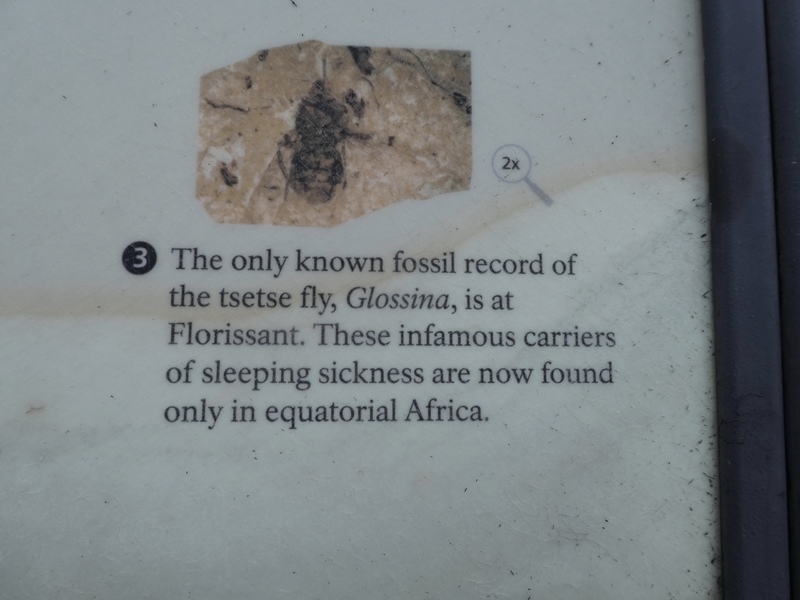 We had tsetse flies? This fossil was not on display the day we visited. Let’s go inside. There are many fossils on display. 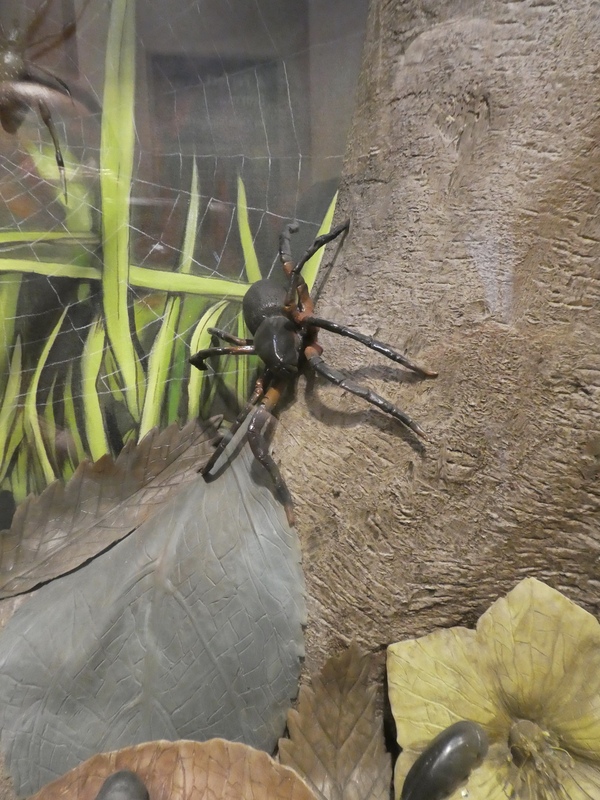 On an interactive display we met this spider. This stealthy ground spider (Palaeodrassus) lived under the bark of a tree. Rather large spider! 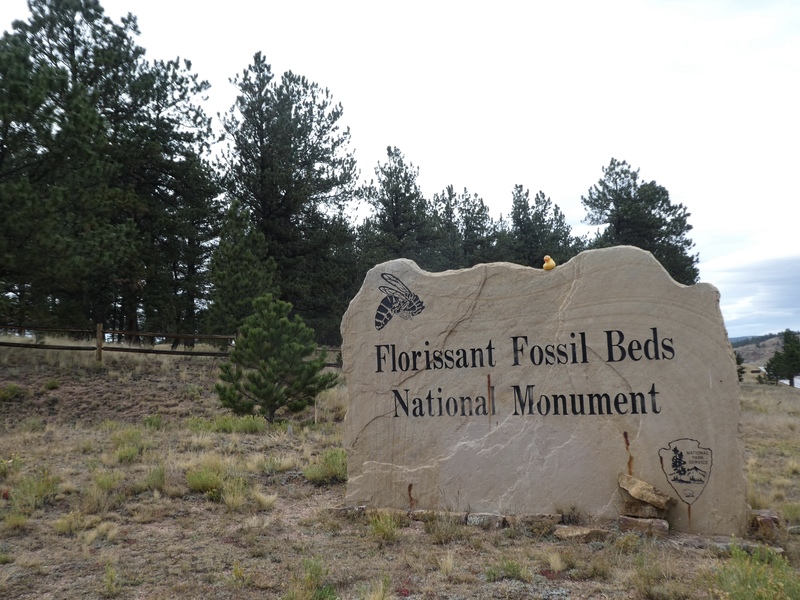 Florissant Fossil Beds, which according to the U.S. National Park Service, now look like a grassy mountain valley in Central Colorado, is one of the richest and most diverse fossil deposits in the world. This place is very interesting and we could spend much more time here. But we are leaving now and heading back home. 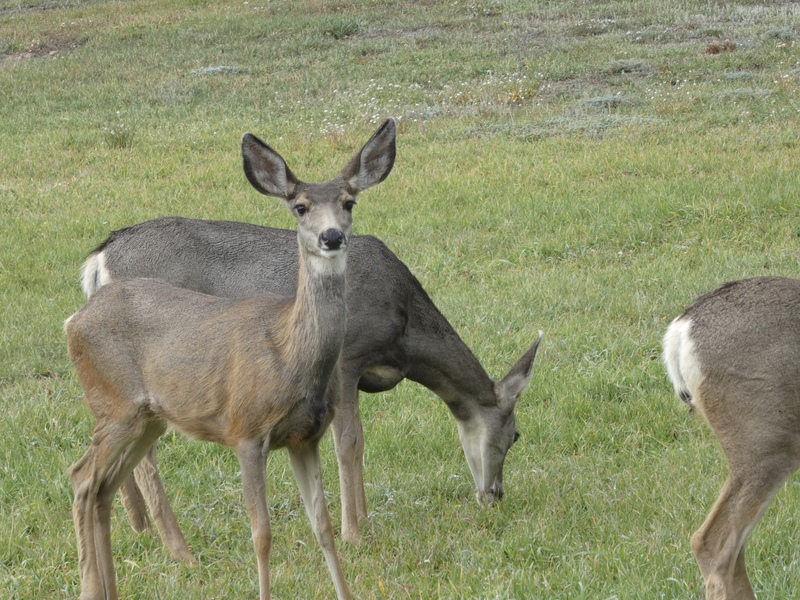 A couple miles to the town of Florissant, we see these deer. There is one male and several females. He is watching. But I like her. I think this deer is watching me. 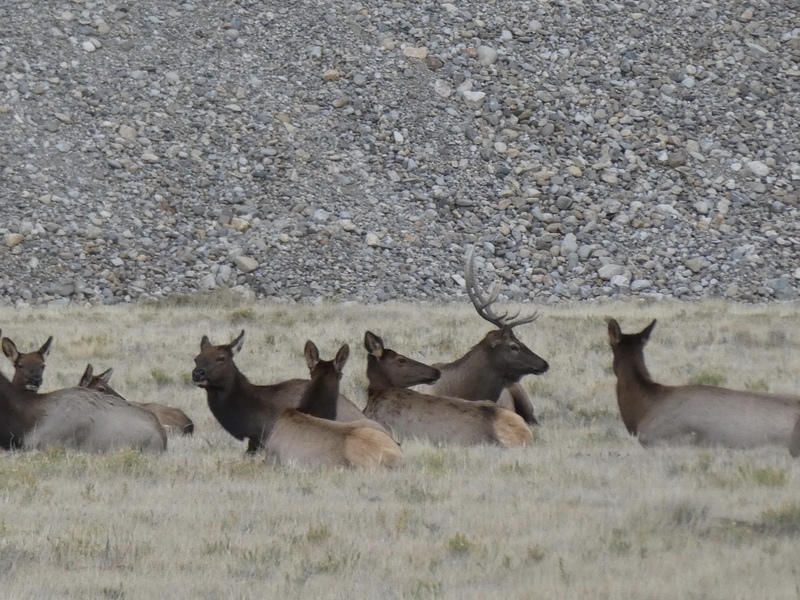 Further along we saw a herd of about 50 elk resting in a grassy meadow. We love seeing the wild animals. 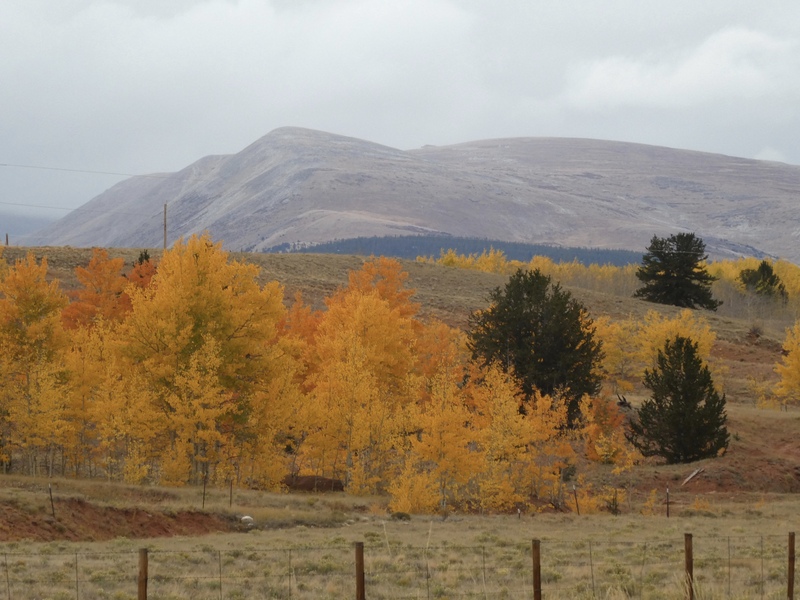 The trees of our northern mountains have changed color and many have fallen. We are in the central mountains now and the leaves are still beautiful. We love to see fall colors in the mountains. Especially on a warm calm day. Are you enjoying the changing seasons where you live also? I, Zeb the Duck, eagerly entered the car. 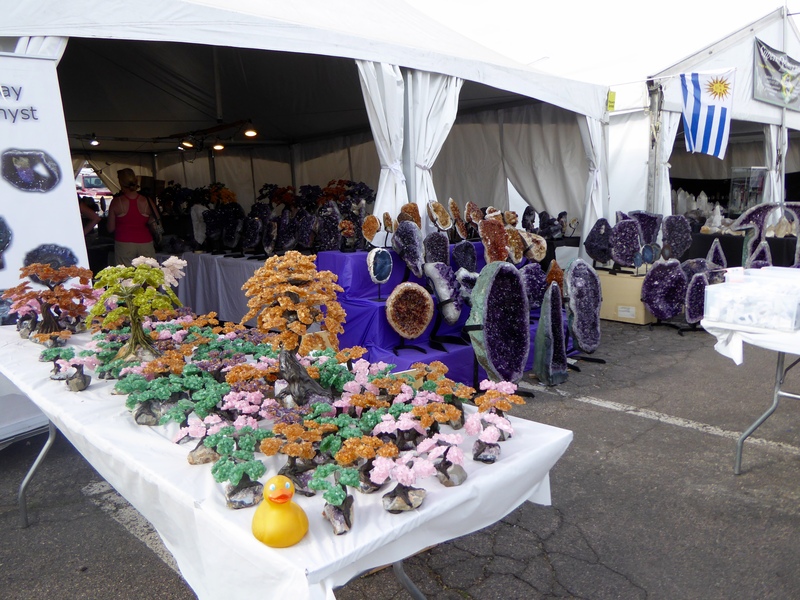 Mom mentioned the mineral show. I love these shows. 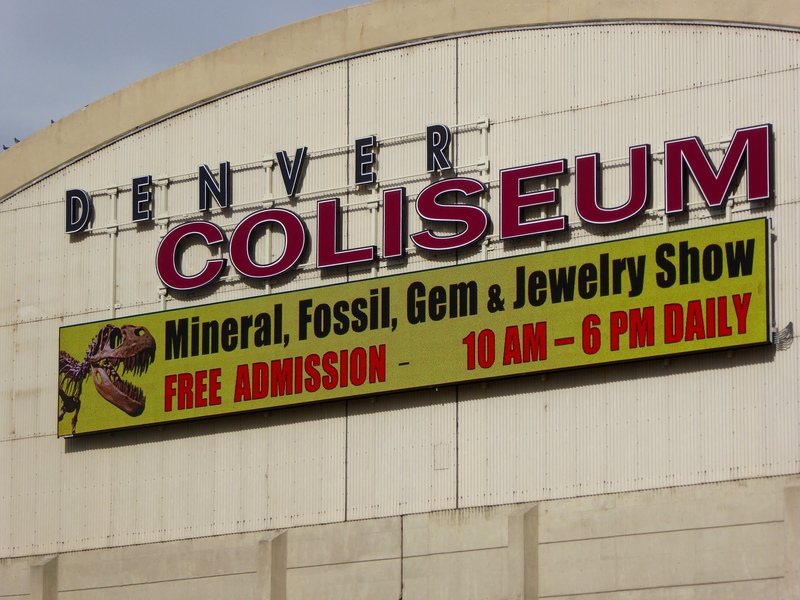 Exhibits and booths are in several places in Denver, but we headed to the Denver Coliseum today. 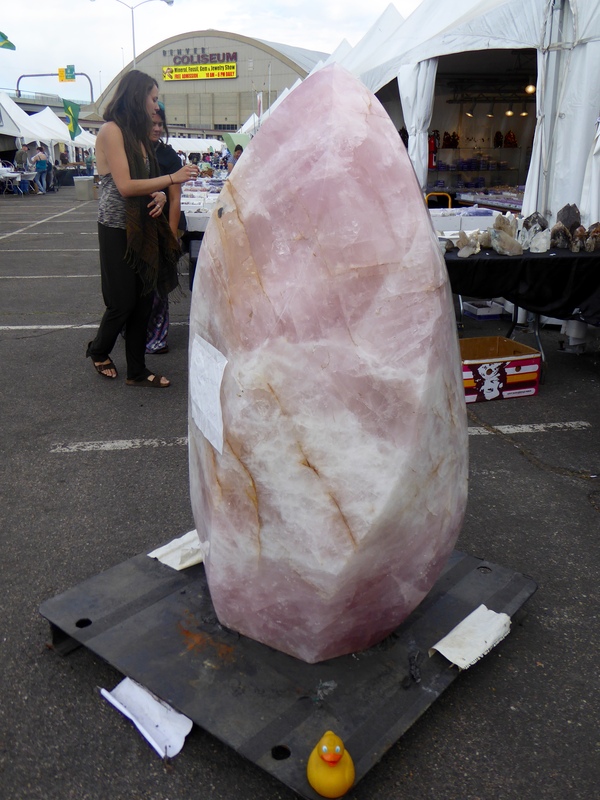 Outside I almost flew to this large Rose Quartz. Oh, here is another place to sit and view the area. Resting on large amethyst and citrine geodes is fun for me. This is something new to us. The sign says these are 7 color jade vases. 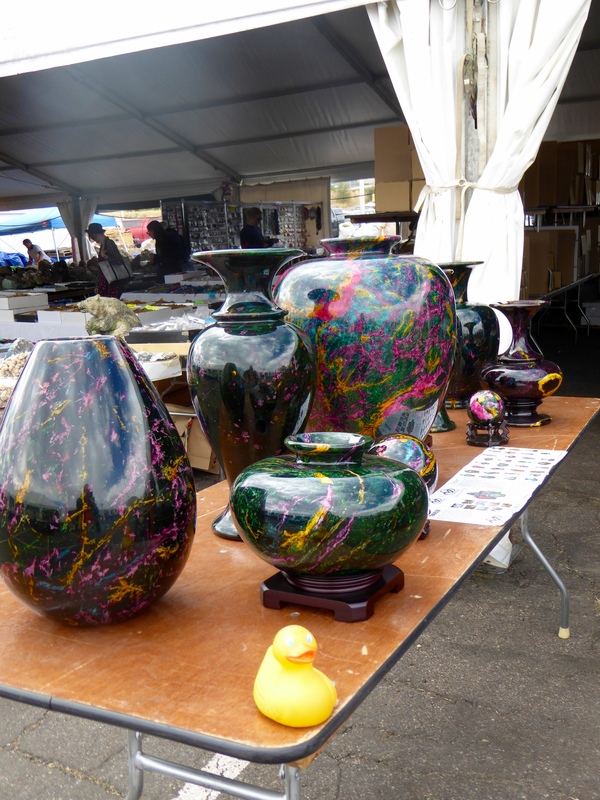 We learned that these vases consist of actinolite (jade) and serpentine, a multi-mineral stone with shades of red, green, yellow, blue, brown, black and white. 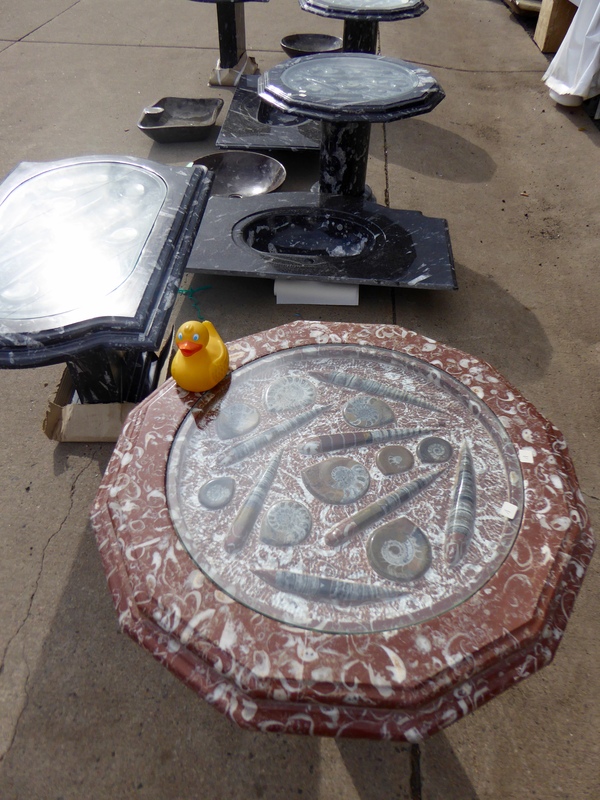 A block of the stone is cut, hand carved, polished, glazed and heated to make these items. For more information visit http://www.consiliodecor.com I enjoy sitting on this table with hematite. Now we are going inside the Denver Coliseum, but we will look at more outside displays later. 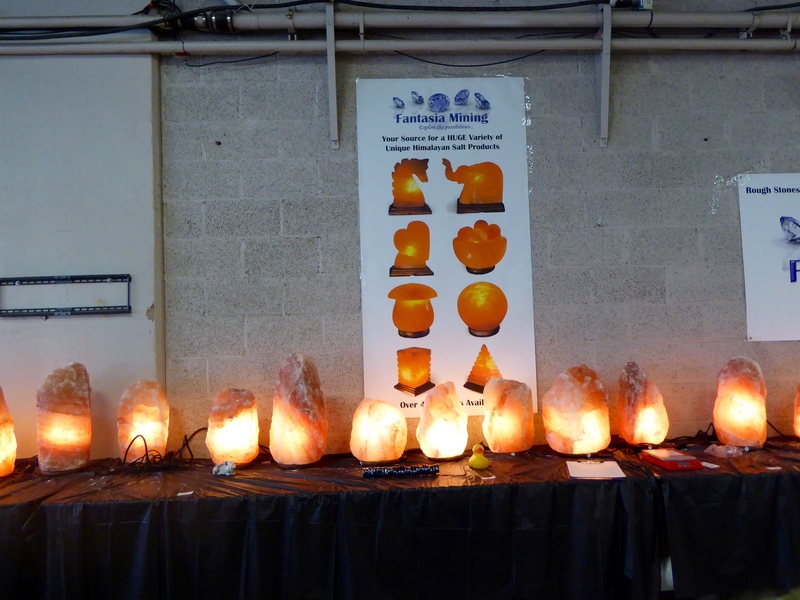 Inside we admire these salt lamps. The Himalayan salt products are fun and useful. For more information visit http://www.fantasiamining.com Mom, is this a good idea? 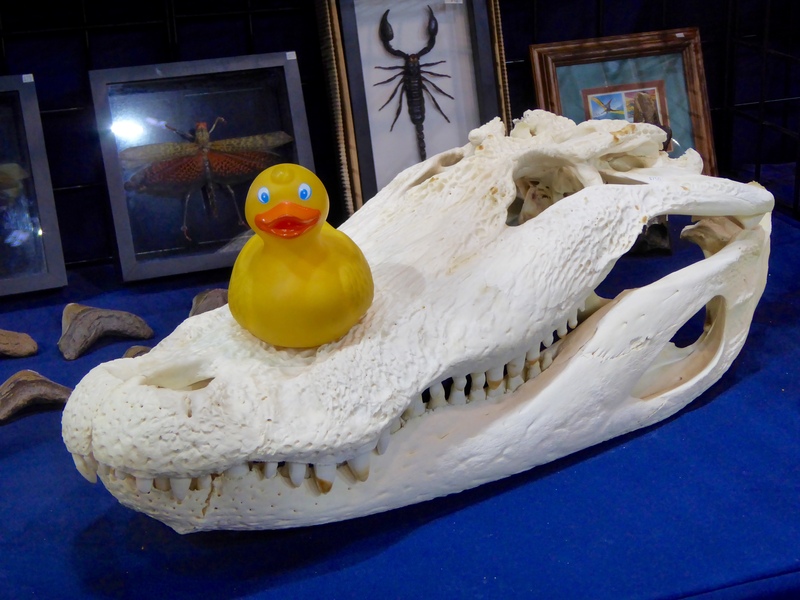 I seem to be sitting on an alligator skull. There are snake skeletons and other things here also. This is a fossil of an ancient bison from Kansas. 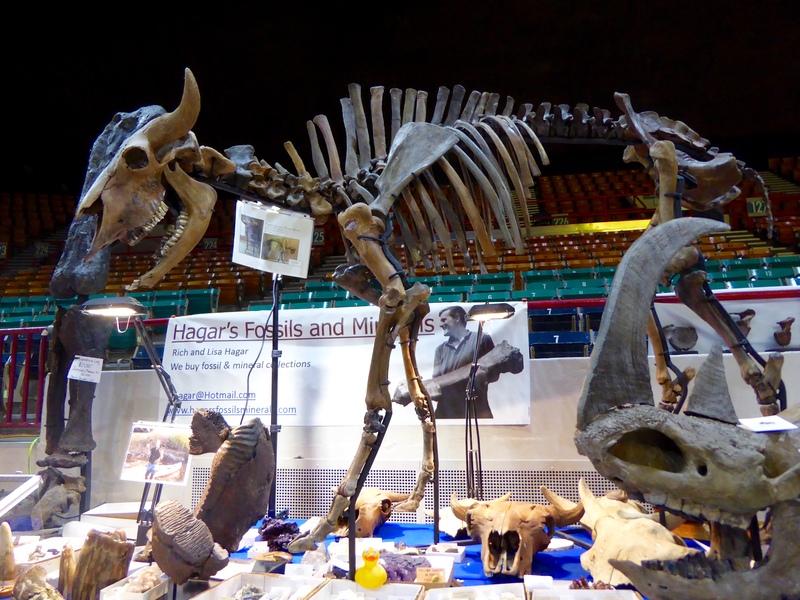 This exhibit is provided by Hager’s Fossils. They also brought this foot. 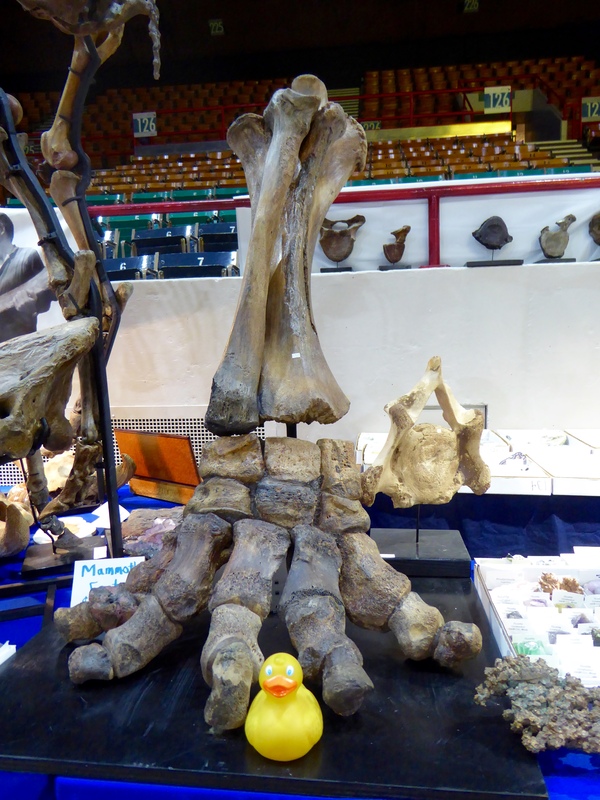 I am sitting next to a mammoth foot and this one foot is so much larger than me, a small rubber duck. And more. We are seeing a matched set of mammoth tusks. 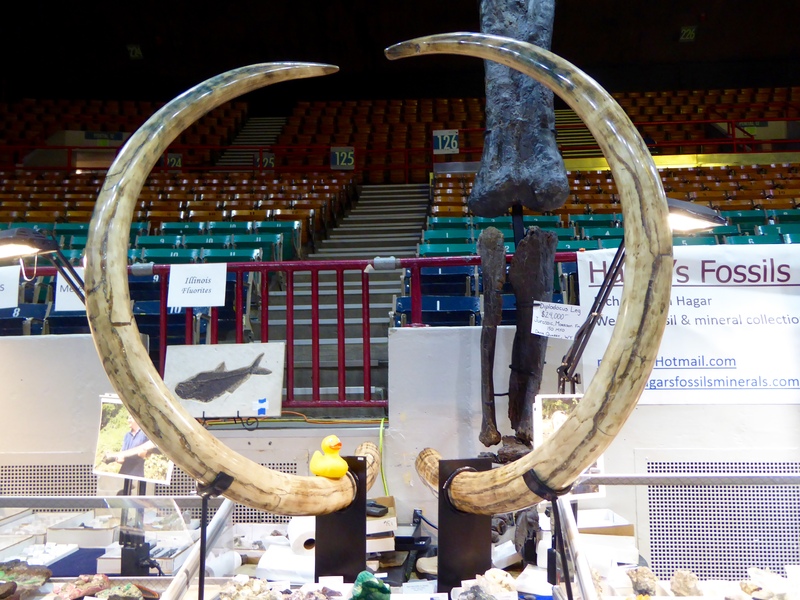 These are from a female mammoth, found in our northern state of Alaska. We talked to Lisa Hager at our Denver show, this year. 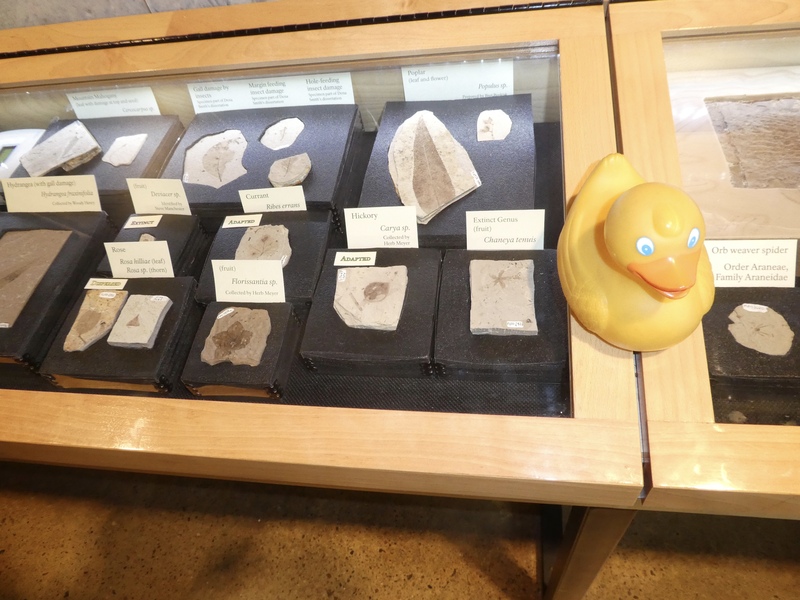 She told us so much about the fossils, and she liked me, Zeb the Duck. For more information on these fossils, visit http://www.hagarsfossilsminerals.com I love seeing all these fossils, but sometimes these ancient items make me a little nervous. I don’t want to break anything, so mom takes me back outside. These fossilized tables are so unusual. I especially like this one with pink. These nearby, huge rocks have been carved. Love the dolphins. The iguana makes me smile. Yes, ducks can smile. 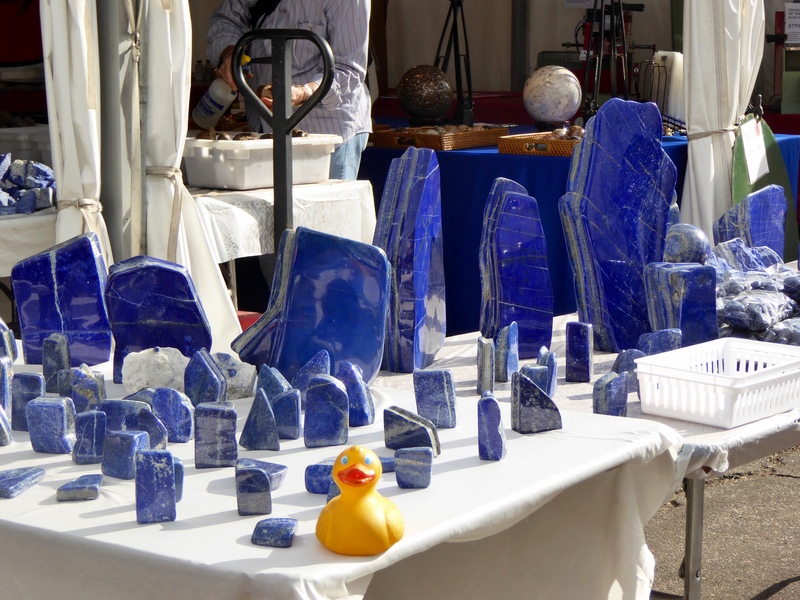 Blue is a pretty color, so we like this display of the stone, lapis. 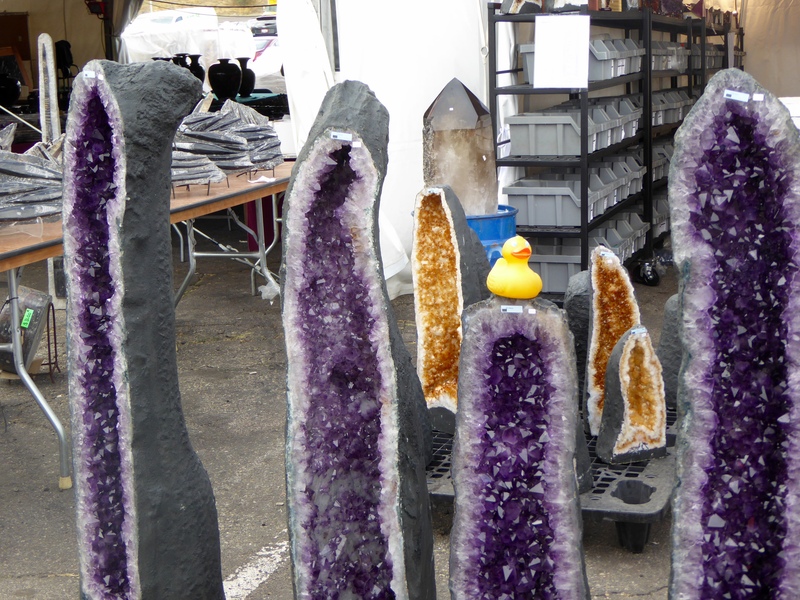 As we were leaving, I just had to sit among these carved items from Uruguay Amethyst. 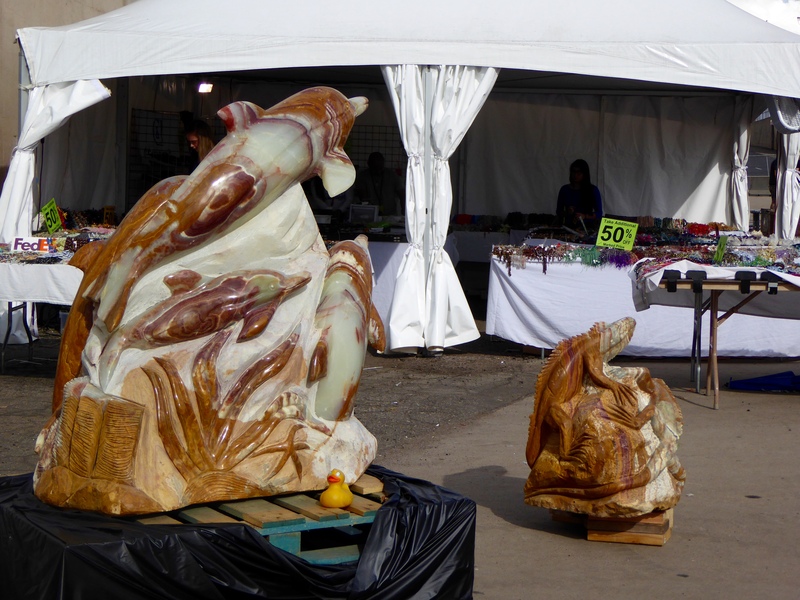 We did purchase and bring home some small carvings, also. 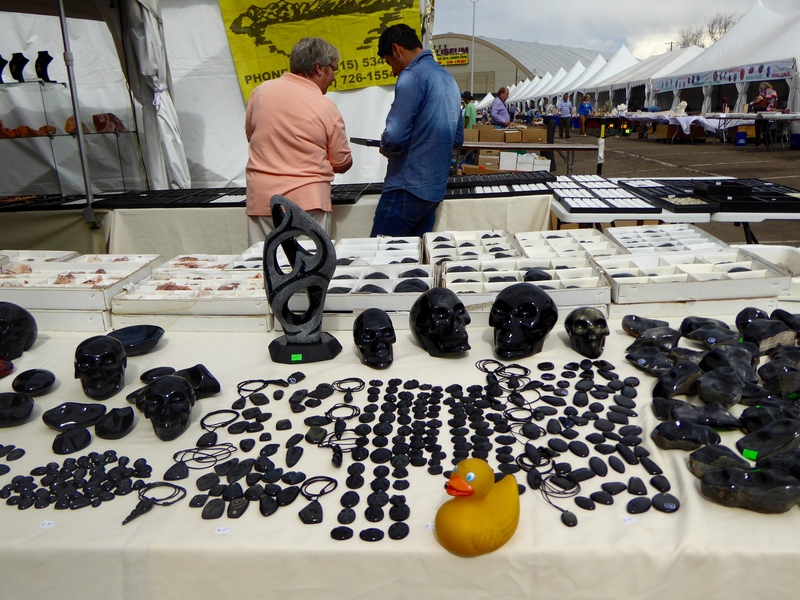 I, Zeb the Duck, love purchasing souvenirs of our visits. Ducks love day outings around Denver. There are always exhibits of something and they are so interesting. I hope you visit exhibits and small shows wherever you live. They are fun to see.